Picking up where we left off… I was telling you about the field trip I took through Turkey’s Tavşanlı Zone, a tectonic suture zone between fragments of continental crust that accreted during the closure of the Tethys Ocean. Day 2 of the trip dawned and we broke fast, and then headed out to a bizarre locality, an exposure of the accretionary complex near the village of Gümüşyeniköy. This is a spot that field trip leader Aral Okay discovered while doing his PhD research in the area. It’s a batch of limestone strata that have been down a subduction zone and then come back up. 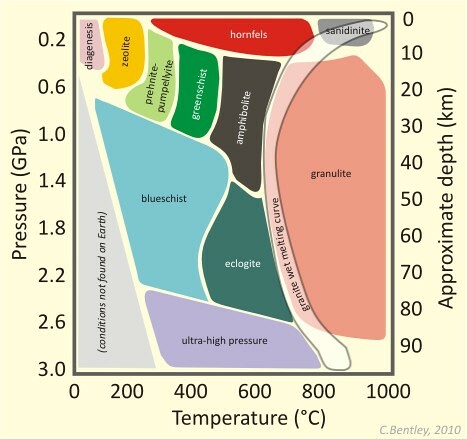 Because the geothermal gradient in this “deep but relatively cold” tectonic scenario supplied so little heat, the recrystallization and metamorphism of these rocks is quite odd. In fact, it is unique in the world. Note the bedding-perpendicular white extensional fractures, filled with calcite. All of the above pictures were of slabs of this rock quarried by local villagers and set up in a big stack for use as building stones. Here’s an in situ outcrop, on the wall of one of these quarries. You can see that the limestone layers are reasonably coherent, and separated by layers of rapidly-weathering shale. On the other hand, how closely packed these “mullions” are in this thick slab suggests that perhaps it’s an accordion-like buckling instead. That would imply the opposite of bedding-parallel extension: that would be caused by compression. Poking around the outcrop pondering these structural mysteries led me to have a series of fun conversations with Alan Smith of Cambridge, a very clever and insightful fellow. Talking with him was one of my finest memories of this trip. These basalts also show lawsonite in veins and amygdules. Our high-pressure, low-temperature journey will continue with Part 5.